Burberry Classic For Men Aftershave Balm is a light and invigorating moisturiser for men that conditions and cares for the skin. Burberry Classic For Men was launched in 1996 to complement the style and image of Burberry fashion. Burberry Classic For Men is a harmonious blend of tranquility and passion, elegance and naturalness, creating a fresh, clean scent. 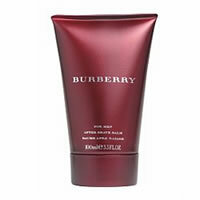 Burberry Classic For Men seemlessly combines Lavender, Bergamot, Thyme, Mint, Moss, Cedar, Amber and rich Tonka Bean.